as well as Saturday Breakout Sessions. 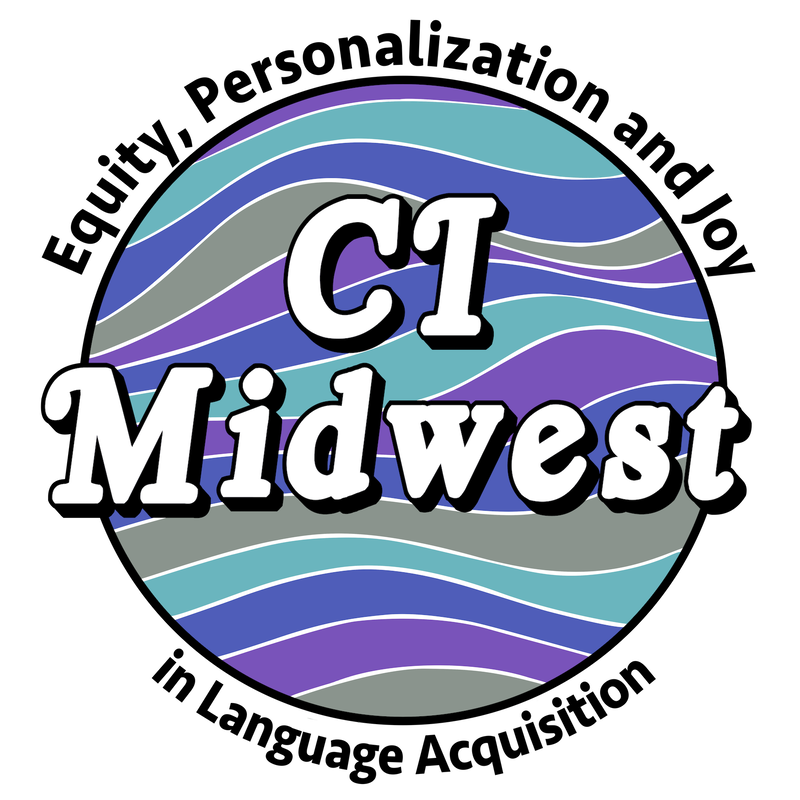 Any teacher of a world language, regardless of context, who wishes to increase engagement, joy and effectiveness of their teaching environment could benefit from attending Comprehensible Midwest. If you believe that each of your students can acquire language and want to learn how to increase retention over time and overall achievement, developing real and measurable fluency, then this conference is for you. 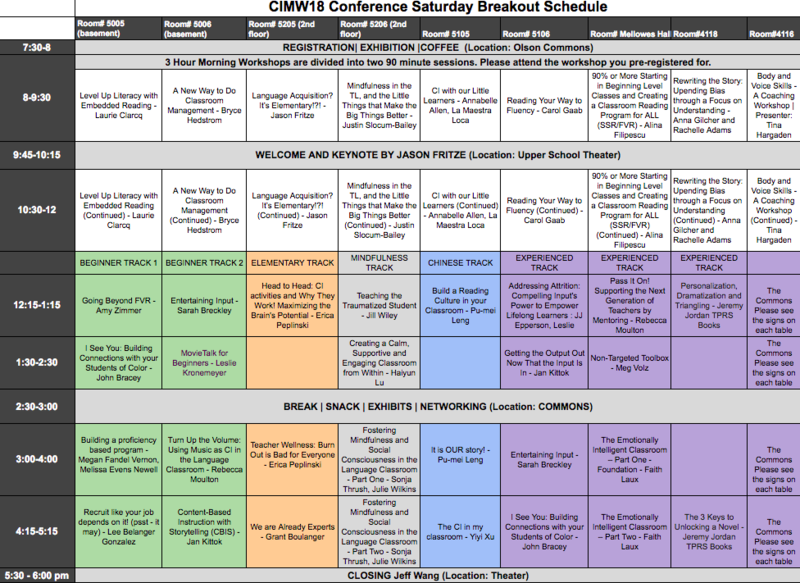 The TENTATIVE Schedule for Saturday BreakOut Sessions can be viewed here. ​Built in to Saturday's schedule, attendees will select and participate in ONE 3 hour morning workshop (Detailed descriptions below)! Time and Location: Friday pre-conference workshops in 2018 will be held at Hilton Milwaukee City Center Hotel. Registration opens at 8am. Workshops begin at 8:30 and end at 3:30. Time and Location: Sunday post-conference workshops in 2018 will be held at Hilton Milwaukee City Center Hotel. Registration opens at 8am. Workshops begin at 8:30 and end at 3:30. A small room block has been placed at Hilton Downtown. Conference rate of $109 per room. Call 414.935.5940 to reserve your room before August 31, 2018. Food: Pre-Conference Workshops Friday, Oct. 5, 2018: Lunch on your own. Conference on Saturday, Oct. 6, 2018: Coffee and tea, lunch provided. Post-Conference Workshop Sunday, Oct.7 2018: Lunch on your own. Pre and Post Conference Workshops on Friday, Oct 5 and Sunday, Oct 7 will be held at the Hilton Downtown in Milwaukee. ​The Conference on Saturday, Oct. 6 will be held at University School of Milwaukee. Description: Successful language learners have one element in common: All have had access to a great deal of Comprehensible Input. This multi-faceted workshop will explore a variety of powerful strategies to deliver CI in ways that will engage learners, deepen comprehension and meaning, and sustain continuous interaction in the Target Language. Learn how to efficiently create multiple contexts using a myriad of authentic and semi-authentic resources and how to differentiate instruction to help all learners reach their full linguistic potential. How to read and send body language signals to encourage subconscious engagement and acceptance. How rejoinders build fluency, camaraderie and buy-in… how to teach them and keep kids using them. How to do questioning differently than most teachers. No more: “Anyone? Anyone?” Including tiered questioning according to levels of thinking and questioning for on-the- spot differentiation. Description: TPRS/CI methods leave us vulnerable to unintentionally reinforcing negative stereotypes. This workshop provides practical skills to mitigate these risks, giving students dignifying and elevating ways to see themselves. Learn how to use visual and verbal cues to provide your diverse student body space to be validated and uplifted. ​Description: Get your hands on some easy-to-implement, very-low-prep strategies by experiencing them first as a student and then practicing them with a partner! Learn how to use Small Talk (the calendar/weather), Card Talk, Student Picture Talk, One Word Images, Class Paragraphs, and Write and Discuss to provide student-generated input that is about the most interesting thing in all the world to your students - themselves and the other kids around them. Experience strategies for building community such as student jobs, applauding/acknowledging students, fostering connections between students, and using student partnerships. Talking of partnerships, we will practice these strategies in teacher partnerships using a circle coaching model, in which everyone works simultaneously with coaching and guidance to develop their instincts and the body awareness needed to carry these practices back into the swirl of day-to-day life in the classroom. You will receive resources to support you in classroom management and CI delivery techniques. These techniques can help you build your personal power as an instructional leader, reduce your stress, streamline your response to challenging behaviors, and speak slowly, calmly, and comprehensibly. My goal in our time together is to literally have you leave with these strategies, attitudes, and techniques embodied in your heart, arms, legs, hands, and voice, so that you can relax into your teaching and enjoy the unique and multifaceted student communities that come sweeping into your classroom each year. Description: What does engagement in an inclusive, Comprehensible Input-based classroom “look“ like? This workshop will offer teachers a myriad of ways to make engagement “visible” in the classroom, all while using Comprehensible Input!! Participants will experience Listening, Reading and Responding interactions using verbal and non-verbal responses. Designed to promote success and build community, these interactions set the stage for future Speaking and Writing opportunities as language is acquired. Appropriate for all languages and all levels, this workshop will help teachers create an interactive classroom where all can participate and succeed! A great base of concepts and activities on which to base the year! Description: Would you like to experience the wonder and magic of Teaching with Comprehensible Input Based Instructions (TCI)? Are you interested in discovering the relationship between learning and the brain? Are you puzzling over how to make thinking visible in your own classroom? Are you familiar with the theories behind TCI? Are you proficient in giving novel commands, chain commands, creating mini-dramas and conducting 3-ring Circus? Are you curious about how to turn “Circling” into personalized questions and answers? Would you like to find out how to create a multi-platform lesson? The most important, how to take one step at a time to navigate this wonderful TCI world? If you answer “yes” to any of the above questions, please join me at this session - A session that empowers TCI beginners to walk out with confidence and passion! Description: We're ALL elementary teacher in World Languages. Experience communication strategies (PQA, stories, content-based lessons) specifically tailored for the elementary language classroom (FLES) that have been used in MS, HS and even college. After a sample of each lesson YOU will take turns teaching a brief part of the lesson in groups. Lesson plans, helpful coaching and props provided! Description: Come experience practices for cultivating mindful calm--in your students and yourself--and growing target-language proficiency at the same time, especially mindful listening with a variety of topics at a variety of language levels. We will also explore a host of little things that we can use to maximize comfort, attention, comprehension, and efficiency in our classes, from ways to use our voices and our bodies to mental habits that will help us prepare for and respond to the many vagaries of teaching in peaceful, productive ways. Description: Elementary language teachers have one of the greatest jobs in the world! Through the use of compelling CI, we can create a truly magical experience for our students and spark a passion for language that can last a lifetime. The challenging reality is, there is usually a limited amount of time to accomplish what we want with our young learners. Come and discover my favorite tips, tricks, and CI strategies with elementary age students to maximize both engagement and input! Walk away with a toolbelt full of ideas and classroom management techniques which you can apply in your classrooms immediately! Description: Let’s stop students’ resistance to reading! Let’s convince students that really interesting things happen when they read! Let’s light up literacy in your classes! Embedded Reading was first created by teachers to address those problems and has developed into a highly successful way to grow students' literacy skills and make good texts even more compelling. It combines several high-leverage practices in order to create the most successful activities possible. By carefully scaffolding text and incorporating highly-effective activities, teachers can change the look of literacy in their classrooms. Come explore Embedded Reading and develop materials for your students! Description: Reading activation strategies help readers of all literacy levels to connect to the text, infer communicative intent, deepen comprehension, and most importantly, acquire language! Learn powerful strategies that compel strong readers, empower weak readers, and help ALL learners acquire loads of language in the process. Learn how to use pre-reading activities, HOT (higher order thinking) prompts, Reader’s Theater techniques and innovative comprehension activities to naturally and enjoyable facilitate L2 acquisition. Description: What does 90% or more comprehensible, contextualized, and compelling Target Language look like and how can you achieve it in the beginning language class? You will leave with ideas about PQA topics and TPRS/CI skills that will help with delivery of lessons. We will also discuss how to create a positive classroom environment conducive to delivering messages 90% or more in the TL, include assigning rejoinders as classroom jobs and as passwords at the door, embedding gestures and movement throughout the lesson, teaching the skill of circumlocution, adding transitions such as “call and response”, and ultimately creating a strong, inclusive community of target language speakers. We will also discuss how to create a classroom reading program in the Target Language. Creating an SSR/FVR program requires not just a library of books, but time, student motivation and buy-in, consistency, student education on how to choose comprehensible books, accountability that doesn't translate into more homework, and the teacher modeling reading in many different forms. Teachers will learn about the components of a successful reading program with a glimpse into student opinion and reflection. Presenter: Tina HargadenOur bodies can be valuable instruments for supporting comprehension in a 90%+ Target Language classroom. Description: EVERYONE can learn to be more dramatic and playful in their classroom. You do not have to be a total clown to engage your students with your voice and physicality. Even soft-spoken, calm introverts can enchant a group with the right use of their instrument. Learn and practice specific physical and vocal skills that will support you in making your speech more engaging and comprehensible to your students, and also our drawing skills, to use the whiteboard to support comprehension. Leave way stronger than you came, with more tools in your tool belt and confidence to be just a little more dramatic. Description: We all know teaching with compelling comprehensible input is best practice. We also know the importance of novelty for keeping our students bought in. Sometimes, re-thinking our go to strategies, and adding a slight twist is all we need to create seemingly brand new activities to enrich our plans and re-energize our classroom and our students. During this workshop, I plan to show you some of my favorite novel twists on strategies you know and love. The day will also be full of engagement hacks to boost student enthusiasm and participation. You’ll walk away with a tool belt full of strategies you can implement first thing on Monday morning, and you’re sure to leave highly entertained, which is just the added bonus of doing a workshop with La Maestra Loca! Teachers of Elementary, Middle, and High School are welcome to attend this workshop! Description: Get your hands on some easy-to-implement, very-low-prep strategies by experiencing them first as a student and then practicing them with a partner! Learn how to use Small Talk (the calendar/weather), Card Talk, Student Picture Talk, One Word Images, Class Paragraphs, and Write and Discuss to provide student-generated input that is about the most interesting thing in all the world to your students - themselves and the other kids around them. Experience strategies for building community such as student jobs, applauding/acknowledging students, fostering connections between students, and using student partnerships. Talking of partnerships, we will practice these strategies in teacher partnerships using a circle coaching model, in which everyone works simultaneously with coaching and guidance to develop their instincts and the body awareness needed to carry these practices back into the swirl of day-to-day life in the classroom. You will receive resources to support you in classroom management and CI delivery techniques. These techniques can help you build your personal power as an instructional leader, reduce your stress, streamline your response to challenging behaviors, and speak slowly, calmly, and comprehensibly. My goal in our time together is to literally have you leave with these strategies, attitudes, and techniques embodied in your heart, arms, legs, hands, and voice, so that you can relax into your teaching and enjoy the unique and multifaceted student communities that come sweeping into your classroom each year.